For some reason, many radiologists freak out when they are faced with reading out films with orthopedic hardware, and will mumble something vague along the lines of “Orthopedic hardware is seen and surgical changes are noted…..”, for fear that they will say something dumb and the orthopedists will laugh at them. I think that this kind of dictation is a real disservice to the patient, especially if you are charging for it. If you are going to bill for the dictation, you should say something intelligent about the film and add some value to the examination. This tendency for radiologists to tap dance their way through orthopedic dictations has not gone unnoticed by the orthopedists. In a growing number of medical centers across the country, orthopedists are pressing their hospital administrations for the right to bill for film interpretation and to cut the radiologists out of the loop completely. In some hospitals, they have been successful. Health plan managers and third-party payers are increasingly under the gun to reduce health care costs, and it is hard to argue that radiologists should continue to receive compensation for zero-content dictations. I would hate for this to happen at UW, because the great majority of my practice consists of studies ordered by orthopedist. So, how can radiologists add some value to the examination? We are never going to know the history, physical findings, surgical findings and postoperative course as well as the orthopedists do. However, we do know imaging better than they do. Although orthopedists as a group do a superb job of interpreting plain radiographs on trauma patients, they tend to do much less well as a group when it comes to other disorders, such as metabolic bone disease, infection, neoplasms or arthritis. It is the radiologist’s job to look closely for these entities. They are likewise on much shakier ground when it comes to understanding the underlying physics, indications, and interpretation of radionuclide bone scans, fluoroscopy, ultrasound, CT and MRI. Therefore, it must be the radiologist who monitors the imaging workup and suggests the most efficacious and cost-effective followup imaging studies for each patient. Another important role of the radiologists is film quality control. One only has to look at the outside films taken at the offices of most nonradiologists to see what kind of difference we make by monitoring such mundane matters as processor chemistry, cassette cleaning, film densitometry, etc. The following points should be kept in mind when performing radiographs of orthopedic fixation hardware. Even though the orthopedists have already looked at the same films, the radiologist should act as a general safety net under them and carefully look for problems of fixation and fracture healing. Specifically, one should look at the fracture position for problems of alignment, apposition and rotation. One should also look for problems with the fixation device, such as incorrect application of the device, device failure, or infection of the device. The orthopedists have certain goals when they contemplate surgical fixation on a patient. First, they want to provide anatomic reduction of the fracture fragments and then maintain them in that position with some form of stable fixation. While doing this, they want to preserve the blood supply to the bone and associated soft tissues by means of atraumatic surgical technique. Finally, they want to provide early, active, pain-free mobilization of the patient to help stimulate healing and to help prevent postoperative complications such as pulmonary emboli. All things being equal, most orthopedists would prefer to treat a fracture with closed technique. However, sometimes this is not possible, and operative fixation is necessary. Several indications for operative fixation are shown below. It’s hard to say anything intelligent about orthopedic hardware unless you know the general names and function of the various orthopedic devices. I am not proposing that you learn the specific manufacturer or model number of each device. This is as hard for us to keep up with as it is for orthopedists to keep up with the latest MR pulse sequences. However, I do expect you to learn the general name and function of each device. Fortunately, this is not too difficult. A general classification of orthopedic fixation hardware is shown in the next table. One of the current tenets of orthopedic fixation is that bone heals better if the fracture fragments are pressed firmly together. Many orthopedic devices are designed to do just that, as well as their primary function of stabilizing the fracture in anatomic alignment. Fracture compression increases the contact area across the fracture and increases stability of the fracture. It also decreases the fracture gap and decreases stress on the orthopedic implant. This compression can be static, where the compression is produced by the fixation device alone, or dynamic, where body weight or muscle forces are used to produce additional compression. Screws are one of the most ubiquitous hardware devices. They may be used by themselves to provide fixation or in conjunction with other devices. Any screw that is used to achieve interfragmental compression is termed a lag screw. Such screws do not protect fractures from bending, rotation or axial loading forces, and other devices should be used to provide these functions. The two most common types of screws are cortical and cancellous screws, as shown below. Cortical screws tend to have fine threads all along their shaft, and are designed to anchor in cortical bone. Cancellous screws tend to have coarser threads, and usually have a smooth, unthreaded portion, which allows it to act as a lag screw. These coarser threads are designed to anchor in the softer medullary bone. Another commonly used screw is the cannulated screw, so called because of its hollow shaft. Although these screws have somewhat diminished pullout strength compared to conventional screws, cannulated screws have many advantages over other screws, especially the precision with which they can be placed. To place these screws, the orthopedist first drills a small Kirschner wire across the area of interest under C-arm fluoroscopic control. 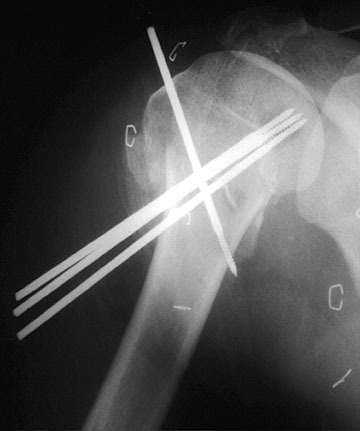 These “K” wires can be placed and replaced with minimal trauma to the bone until they are in optimal position. The cannulated screw is then placed over the wire and slid down to the bone surface. A special driving tool then allows the screw to be driven into the bone along the shaft of the K wire, in a manner very similar to the way radiologists pass angiographic catheters over guide wires using the Seldinger technique. The K wire is then withdrawn. One major complication of these screws is perforation of the articular surface when these screws are placed into a bone with their tips close to the subchondral bone. If an orthopedist is concerned about this possibility during surgery, contrast material may be injected through the hollow center of the screw in question — spillage into the joint cavity under fluoroscopy will be unequivocal evidence of perforation. 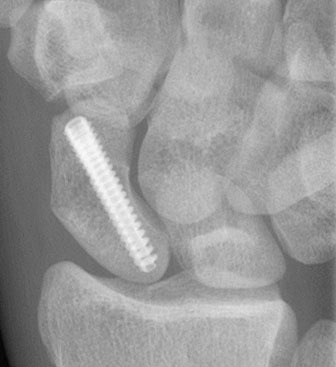 Certain specialty screws are also often seen. The Herbert screw is designed for use in fractures of small articular bones such as the carpals. It is cannulated and threaded at both ends. These threads run in the same direction, but the proximal portion has a wider pitch to its thread. Thus, when the proximal threads engage in the bone, they tend to move through the bone faster than the threads at the distal end, causing the two ends of the bone to compress together. 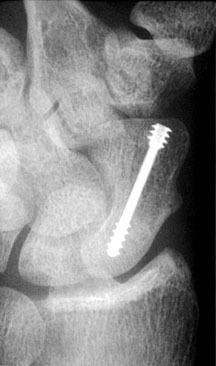 This screw is used where a standard screw would impinge on adjacent tissues, such as in the treatment of scaphoid or osteoarticular fractures. Orthopaedists at our institution are now using the Acutrak screw for the treatment of most scaphoid fractures. This screw, like the Herbert screw, is cannulated. It is also headless, which allows it to be implanted below the surface of the bone. It uses the same concept of variable thread pitch as the Herbert screw, but unlike the Herbert screw, is fully threaded. This feature may improve internal holding power, as well as allow a fracture or osteotomy site to lie anywhere along the length of the screw. Another specialty screw occasionally seen is the interference screw. This screw is sometimes used in the repair of the anterior cruciate ligament (ACL). In this type of repair, the surgeon employs a cadaveric allograft ligament which has a block of bone still attached at both ends. A tunnel is drilled through the distal femur and the proximal tibia, and these bony blocks are placed within the tunnels. The interference screws are placed alongside the bone blocks so that they tightly wedge them into the side of the tunnel and prevent them from moving. One final word on screws: in order to use them, you have to make a screw hole in the bone or in the hardware that uses them. This is of note because screw holes weaken whatever material they pass through. I have read biomechanical estimates that one screw hole passing through both cortices of a femoral shaft will weaken that femur by 90 % to some types of stress! There are several ramifications to this for the orthopedist and radiologist. First, since these holes weaken bones and orthopedic hardware, we should look closely at these areas on the films since the bones and metal will tend to fracture at these sites. Second, orthopedic hardware is generally removed as soon as possible so that these holes can fill in with new bone formation and bring the bone strength back up to normal. Washers are generally used in two situations. They are used to distribute the stresses under a screw head so as to prevent thin cortical bone from splitting. Serrated washers are used to affix avulsed ligaments, small avulsion fractures or comminuted fractures to the remainder of the bone. Plates come in several flavors, and are named for their function. In general, there are compression, neutralization and buttress plates. Compression plates are used for fractures that are stable in compression. They may be used in combination with lag screws, and they may provide dynamic compression when used on the tension side of bone. The dynamic compression plate is one of the most common types of plates, and can be recognized by its special oval screw holes. These holes have a special beveled floor to them with an inclined surface. If desired, this inclined surface can be used to pull the ends of the bone together as the screws are tightened. 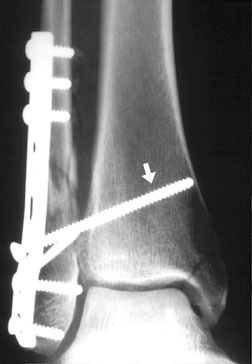 dynamic compression plate (DCP) bridging a fibular fracture — the arrow is pointing to a syndesmosis screw which is bridging the tibiofibular syndesmosis, whose ligaments have been torn during the injury — also noted is a medial malleolar fracture bridged by a screw channel, but apparently little else. What is holding the parts of this fracture together? A new variety of dynamic compression plate is currently undergoing trials at UW. This variant is called a low contact dynamic compression plate (LCDC plate). This plate is distinguished from the conventional DCP by the way it is undercut under each screw hole and between adjacent screw holes. The rationale for this design is as follows. Whenever one clamps a plate down against the surface of a bone, one markedly diminishes the periosteal blood supply to that area. Theoretically, one would expect this to slow healing of the fracture beneath that plate. The undercutting of the plate decreases the amount of contact that the plate makes with the bone surface, and hopefully will increase the periosteal blood supply and, it is hoped, fracture healing as well. Another type of plate seen commonly at UW is the reconstruction plate, which is widely used for the repair of pelvic and calcaneal fractures. This plate is fairly malleable, and can be readily shaped and trimmed to length for support of fractures through complex bony surfaces. These are also occasionally used for posterior fusion of the cervical spine. Neutralization plates are designed to protect fracture surfaces from normal bending, rotation and axial loading forces They are often used in combination with lag screws. Buttress plates are used to support bone that is unstable in compression or axial loading. These plates are often used in the distal radius and tibial plateau to hold impacted and depressed fragments in position once they have been elevated. Yet another type of plate commonly seen on postoperative films is the blade plate. This plate is usually shaped at an oblique or right angle and is designed to be used with subtrochanteric femoral fractures or supracondylar fractures of the femur. It is also occasionally used to bridge a femoral osteotomy. One arm of this device has a chisel-shaped end that is driven into the bone, bridging the fracture. The other arm is used as a side plate and anchored to the bone with multiple screws. There are a variety of devices used to treat femoral fractures. The blade plate above and the Jewett nail below are not used so commonly these days, but patients still walk into orthopedic clinic wearing these devices every day. 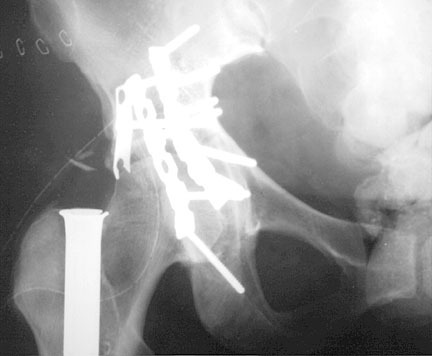 The most common device used nowadays is the dynamic hip screw, also shown below. Its main design goals are to resist angular deformation while permitting early fracture impaction by allowing shortening along the axis of the lag screw. This device is specifically designed to treat intertrochanteric fractures, but is occasionally used to treat subtrochanteric fractures as well. Like the blade plate, it has a side plate that is attached to the distal femur with several cortical screws. Rather than a blade, this plate has a hollow metal barrel through which a large lag screw is placed. This large lag screw is placed so that it bridges the femoral fracture. Ideally, this lag screw should go right down the center of the femoral neck on every radiographic view, and its tip should be in the subchondral bone of the femoral head. The hollow barrel of the side plate holds the lag screw, and hence the femoral neck and head at an anatomic angle for healing. It also allows the lag screw to slide distally as the ends of the fracture impact and the fracture fragments move closer together. When followed over time, is quite common to see evidence of this impaction as the lag screw telescopes down into the barrel of the side plate. The average amount of impaction seen with these devices is about 7 mm. These devices can fail just like any other device. The cortical screws holding the sideplate to the bone may come loose. The sideplate may fracture at a screw hole. 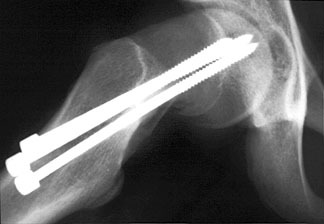 The lag screw may perforate the articular surface of the femur. These complications and many more await the eagle-eyed radiologist. Dynamic hip screws (DHS) are a popular device used to bridge fractures of the well-vascularized intertrochanteric area. However, when the fracture occurs a bit more proximally in the femoral neck, parallel screw fixation is often used instead. The rationale here is that the parallel screws will cause less trauma to the tenuously supplied proximal head and neck fragment than a larger screw such as the DHS. If the screws are placed parallel to each other, they can allow the fragments of bone to impact together, much as a DHS will. Knowles pins, (shown below) were once commonly used for this purpose, although other types of screws are more commonly used today. 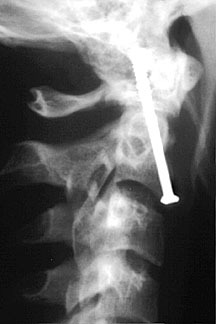 Another type of pin used currently at Harborview is the percutaneous pin. They are commonly used there to treat humeral neck fractures. These pins have a self-threading screw tip and are placed under C-arm fluoroscopy. A variety of wires are used by orthopedic surgeons. One common type is the cerclage wire, in which the wire is placed around the circumference of the bone to pull various fracture fragments together. In the example below, two cerclage wires are used in conjunction with an intramedullary nail to provide support for the comminuted fragments above the transverse fracture. Yet another type of wiring seen in orthopedic surgery is called tension band wiring. This type of wiring may be placed either by itself, as shown in the patellar fracture below, or in conjunction with a screw or Kirschner wire. These tension band wires perform a sort of “biomechanical judo”, in that they take the normal muscular pull that is trying to pull the fracture fragments apart, and use it in a clever way to force the bony fragments together in compression. In the example below, one can see that the actual location of the tension band wire is important. If the wire is placed too far posteriorly (left drawing), the muscular pull on the wire will cause the fracture to gape open anteriorly (distraction). When the wires are placed far enough anteriorly (right drawing), the muscular pull now causes the patellar fragments to be pushed firmly together in compression. This same sort of biomechanical judo is employed when the tension band wire is used with a wire or screw. In the example below, a fracture is seen through the olecranon process. In a situation like this, the triceps muscle group will exert a large force tending to pull the proximal fragment far away from the rest of the ulna. Even when the fracture has been bridged by one or more screws, there is a tendency for these screws to be pulled out by the triceps. The addition of a tension band wire as shown below will convert some of the triceps traction into compression of the ends of the bone together and prevent the screw from pulling out. As I have already alluded, the Kirschner or “K” wires are a very handy device in the hands of the orthopedist. Besides their usage with cannulated screws, they are used in many other ways to help reduce and stabilize fractures. A K wire is essentially an unthreaded segment of extruded wire which is drilled into bone like a drill bit. The major advantage of a K wire is that it is very small and relatively noninvasive as hardware goes. It can be placed through an articular surface or even across an open physeal plate without injury. K wires can be used for either temporary or final stabilization. 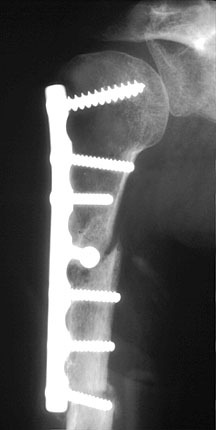 They can be placed between bones as shown below, or they can be used as an intramedullary device to bridge a fracture of a small tubular bone. They are commonly used to help piece all of the fragments of a comminuted fracture prior to placement of the final fixation device, especially with an intraarticular fracture. 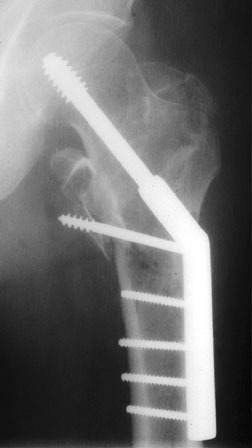 A large variety or devices are placed down the intramedullary canal of bones, ranging from Kirschner wires up to large femoral nails. One can generally classify these devices by whether intramedullary reaming is necessary prior to placement of the device. With the first nails placed down the femoral shaft, the medullary space first had to be reamed out so that the large nail would not shatter the bone as it was hammered down the shaft. However, reaming is an invasive procedure, and can compromise the already tenuous blood supply of the medullary space. Reaming can also lead to thermal osteonecrosis, especially if the medullary canal is small, a tourniquet is used during reaming, or there is marked soft tissue injury. If intraosseous pressure becomes elevated during reaming, fat emboli to the lungs are possible. For these reasons, a variety of unreamed devices have been developed. The Rush rod, shown below, has a chisel-like tip, and is commonly used for fibular shaft fractures, and occasionally in other tubular bones as well. Another type of unreamed nail is the Ender nail. These nails also have a chisel-like end. These nails are usually used three or four at a time, and pushed through a cortical hole up or down the shaft of the bone and across the fracture under fluoroscopic control. The odds-on favorite nowadays for fixation of fractures of the femoral or tibial shaft is a reamed or unreamed nail like the ones shown below. These nails permit early weight-bearing and can be placed with closed technique, which avoids damage to soft tissue and to the periosteal and muscular blood supply. If the fracture is transverse and otherwise uncomplicated (not comminuted, rotated or too near the end of the bone), the nail may be placed by itself. However, interlocking screws are very commonly added both proximally and distally to provide stability in cases of comminution, and to prevent shortening of the bone or rotation of the fracture fragments. When these screws are used, the nail is commonly referred to as an “interlocking” nail. Subtrochanteric fractures are a particularly difficult type of fracture to treat, and they behave very differently from a garden variety intertrochanteric fracture. In the latter fracture type, a dynamic hip screw (DHS) can be used to merely provide angular support. Longitudinal support by the DHS is not as important in this fracture type, since the ends of the bone tend to impact against each other in a stable manner. Subtrochanteric fractures, on the other hand, put a huge stress on a DHS, especially along the sideplate. For this reason, special nails such as the Zickel nail shown below and the gamma nail have been developed. These devices are much stronger devices than the DHS, and offer a much shorter moment arm for rotational forces to act upon than the DHS. On the minus side, these nails are also more invasive. 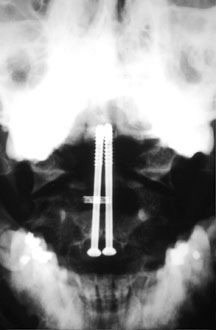 The prototypical spinal fixation device is the venerable Harrington rod. These tend to come in two flavors: distraction and compression. The hooks are designed to be placed under the lamina or transverse processes, and the device is either extended or compressed to the desired position. Sometimes both types of rods will be used in the same spine. Harrington and Edwards rods have been largely superseded by other newer devices. The most common spinal fixator that I see these days is some form of posterior spinal rod. These rods are usually used in pairs, and are attached to pedicular screws which are anchored in multiple vertebral bodies above and below the site of treatment. The images above are anteroposterior (AP) and lateral views of bilateral posterior spinal rods bridging L4, L5 and S1. 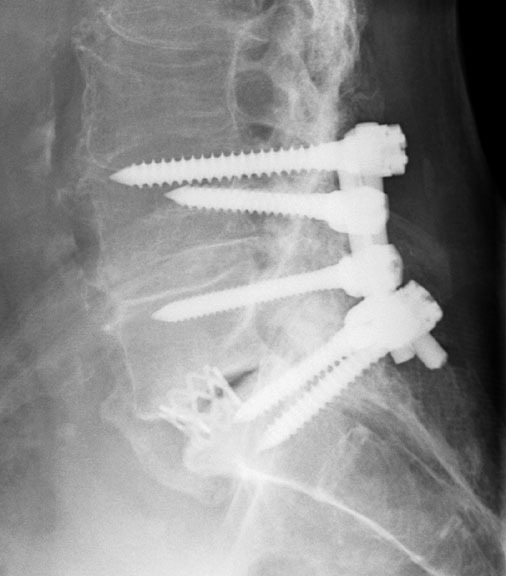 This patient underwent spinal fusion following a laminectomy done for spinal stenosis. The small metal cage seen in the L5-S1 disk space contains bone graft material which will hopefully promote osseous fusion at this site. All things being equal, orthopedists generally prefer to treat fractures in a closed fashion. Failing that, they would prefer to treat them with internal fixation. However, sometimes there are extenuating circumstances that preclude the use of internal fixation. External fixators can be very helpful in these circumstances. 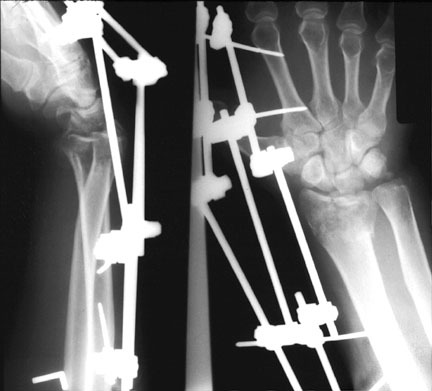 The weak link in the external fixation system are the threaded pins that are anchored in the bone. These pins should pass through the cortex on either side of the medullary space, and only a few millimeters of the pin tip should ideally protrude through the distal cortex. 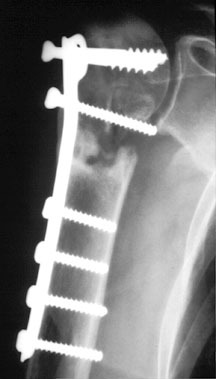 The usual complications of this fixation system are loosening or infection (or both) of the pins. Lucency developing about a pin as it travels through the cortex is evidence of loosening of that pin. Infection is a much harder diagnosis to make radiographically. Long before signs of radiographic infection develop, the orthopedist will make the diagnosis by seeing pus oozing up along the pins as they exit the skin. Even the presence of periosteal new bone formation about the pin tracts is unhelpful, since these drilled holes are after all fractures of a sort, and fractures do produce callus, even without infection. There is one late finding which is said to be pathognomonic of pin tract infection. This has been termed the “ring” sequestrum sign, although the sequestrae thus formed actually are shaped like cylinders, rather than rings. The appearance of this finding is due to the particular geometry of a pin and pin tract, which are cylindrical in shape. As a pin tract becomes infected, the bone immediately adjacent to the pin becomes infected first, and a certain amount of it dies. The viable bone adjacent to this infected dead bone then becomes hyperemic and becomes relatively osteopenic. The infected dead bone remains at its original density. Once the pin has been removed, if one looks directly down the pin tract with a radiograph, this cylinder of dead bone looks like a “ring”. Occasionally, such a cylinder will be dense enough to also be seen when viewed at 90 degrees to the pin tract, and it presents as two parallel dense lines surrounded by lucent zones. Nguyen VD, London J, Cone RO 3d. Ring sequestrum: radiographic characteristics of skeletal fixation pin-tract osteomyelitis.Radiology 1986;158:129-131.